Many claim that snorkeling in Mafia Island Marine Park is better than in the Great Barrier Reef; for sure this off-the-beaten-path island offers the best snorkeling in Tanzania. 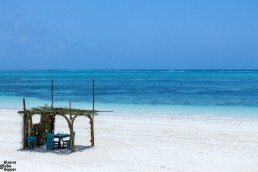 The reefs here are among the healthiest in the Indian Ocean. 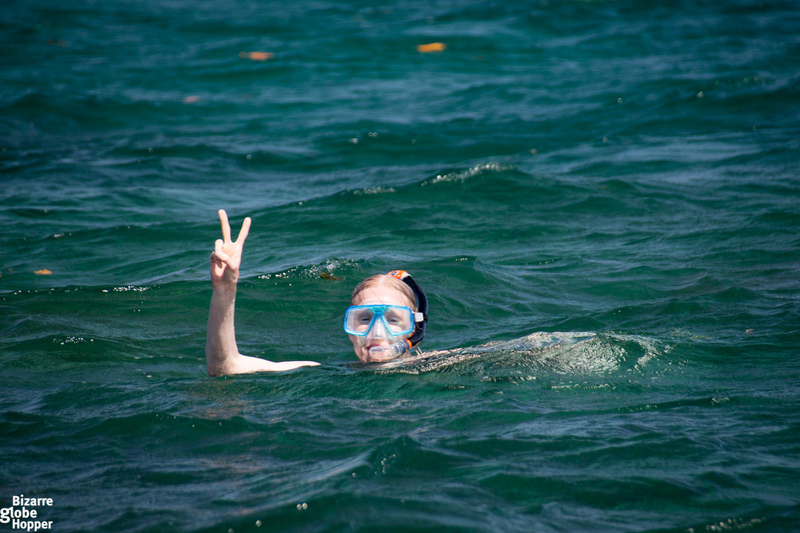 For snorkelers, the park shows its best in Chole Bay, which we were happy to explore. Diversity in Mafia Island Marine Park is among the highest in the Indian Ocean and corals are beautifully bright. While the majority of corals around the world suffered deadly from the “El Nino” in 1998, the reefs of Chole Bay in Mafia Island Marine Park remained mainly intact. 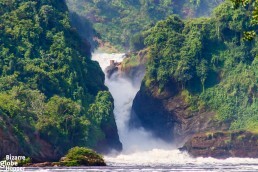 The savior was the fresh ocean water that flows into Chole Bay through Kinasi Pass at every flood tide. 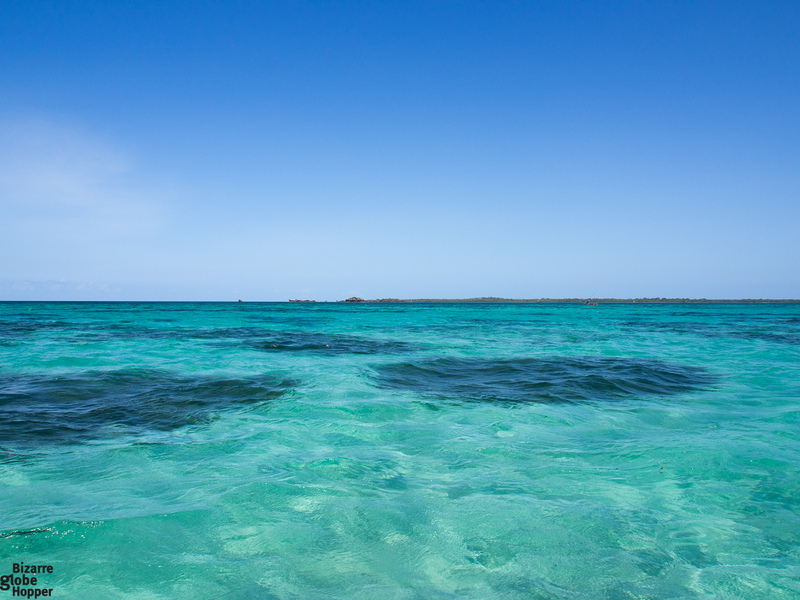 The horseshoe-shaped Chole Bay is the best spot for snorkelers inside Mafia Island Marine Park. The bay extends over 50 square kilometers, to the maximum depth of 28 meters. Shallow reefs are perfect for snorkeling and offer a matchless variety of marine life from soft to hard corals and schools of colorful fish. The best part is that you are going to have all those stunning underwater sceneries exclusively to yourself. Although snorkeling here is splendid, the splendors of Mafia Island remain pleasantly unknown. Check out all the other amazing things to do in Mafia Island from our separate article. 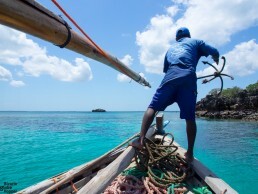 Mafia Island is still off-the-beaten-path snorkeling and diving destination, as most tourists head to better-known islands of Zanzibar or Pemba. 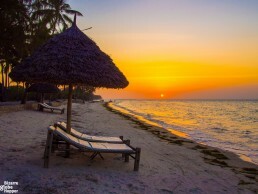 Although I loved the history-rich Stone Town, its street food scene, and the beaches of Zanzibar, I would still pick Mafia Island over Zanzibar for a relaxed island holiday. 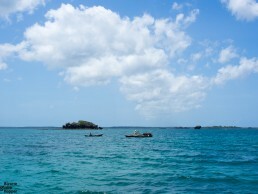 Getting to the Chole Bay is already an exciting part of the snorkeling adventure. 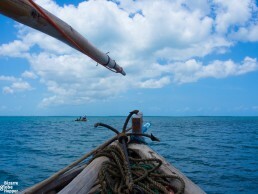 The first surprise awaited us in the knee-high water: a wooden, traditional Swahili fishing boat called a dhow. We were expecting a modern motorboat, but this dhow turned out to be a way more atmospheric solution. 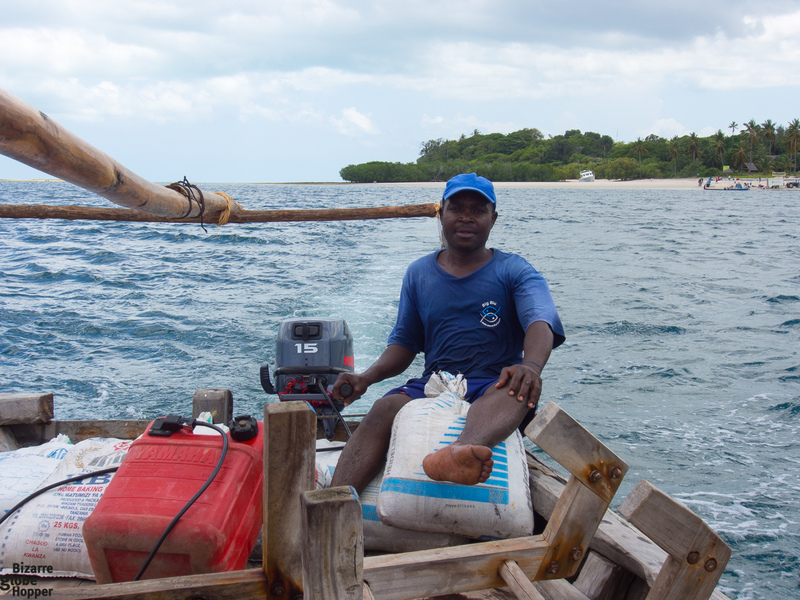 Off we sailed with happy grins, passing a few local boats transporting people and drinking water to the island of Jibondo. Lushly vegetated shores of Chole Island were soon left behind. This tiny island in the shadow of Mafia actually became the capital of the Mafia archipelago after cannibalistic Madagascans attacked Mafia in the 19th century. Several overgrown ruins just off the shore await to be explored – and would deserve a day of their own. Just after Chole rises the island of Juani, one of the largest in the archipelago. 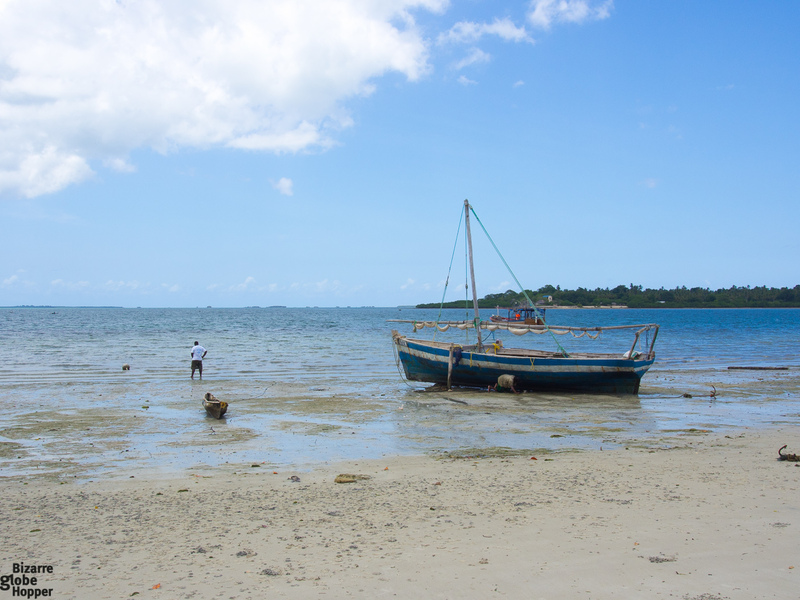 The lagoon between Chole and Juani is so shallow that you can walk between the islets at low tide. After taking in the scenery for about 30 minutes, we were ready to anchor beside beautiful rock formations that are called Kinasi Pass Islets. These coral islets are also home to several birds, like fish eagles, little egrets, and ibis. There are many stunning “bommies” or coral outcrops, which are separated by sand or occasional sea-grass. The fun began immediately after plunging into the azure waters of Chole Bay. Scorpionfish was the first to greet us, but soon after we were enveloped in clouds of tiny fish. In the next hour or so, we admired parrotfish, butterflyfish, angelfish, and Moorish idol – just to classify a few from the supposed 460 species inside the boundaries of the Mafia Island Marine Park. Fish and corals came in different shapes, sizes, and colors. 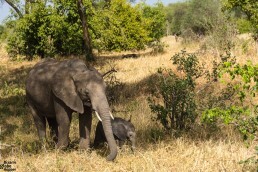 I certainly wish that we’d had a camera with us! Fragile sea fans and gold-hued fire corals emerged from the mosaic of bright colors. Blue-tipped staghorn, a gorgeous violet branching coral, was also present in great numbers. There are supposed to lie more than 50 identified species of coral, including extinct forms, such as tabulate coral. 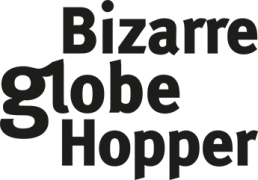 If you are lucky, you might also spot some really weird creatures like unicornfish, giant Napoleonfish or Spanish Dancer. 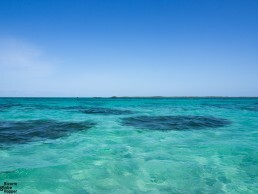 Also, five species of marine turtles roam around the turquoise waters of Mafia Island Marine Park. If you’re visiting Mafia between June and September, be sure to check out the great hatching at Juani Island! After eventually getting a bit tired and chilly, we sailed to our last location while enjoying delicious tuna sandwiches on board. The spot is called Chole Wall. The currents were stronger, which made the experience a bit different, and the corals were slightly deeper. Drifting above a huge table and brain corals felt serene anyway. In the end, we encountered a large area full of dead corals. Our guide said that at this particular spot the corals were too soft and weak to resist the temperature rise. Fortunately, the reefs here are recovering well. Whereas snorkeling and diving are seasonal in Zanzibar and Pemba, Mafia Island is a marvelous year-round destination. The islands around Chole Bay protect the waters from the monsoon winds and make snorkeling and diving on Mafia enjoyable throughout the year. Visibility in Mafia Island Marine Park is great, though a bit tide-dependent. 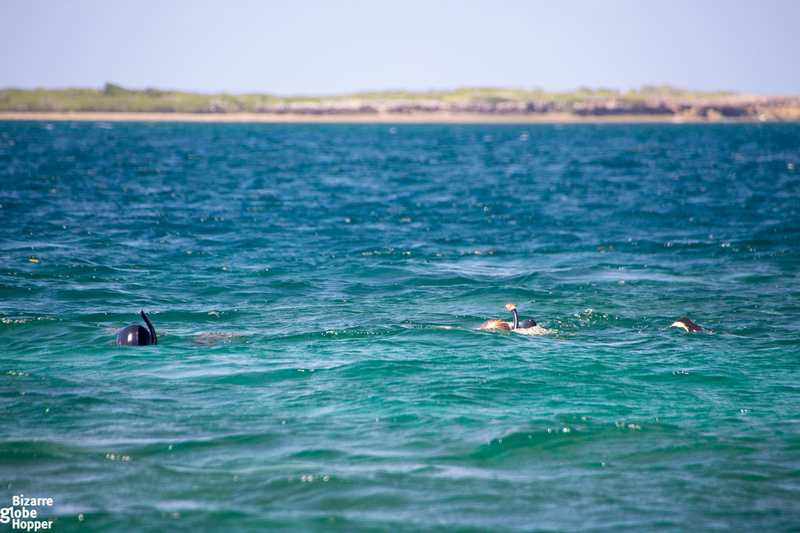 The best time for snorkeling is when the tide is at its lowest, as with the outgoing tide the water becomes mixed. There are some pretty incredible diving sites inside Chole Bay, such as sloping reefs, walls, small caves and caverns, drift, and coral gardens. Wall diving outside the bay gives an opportunity to see bigger creatures, like rays and reef sharks. 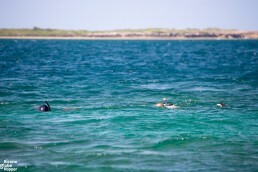 Between October and March, it’s possible to swim with the whale sharks at the other side of Mafia island, just in front of Butiama Beach.  We did that in Mexico, and can’t recommend the experience highly enough! Mafia Island Marine Park is said to offer the best snorkeling and diving in Tanzania. There’s also scientific proof that the coral gardens of Chole Bay have the best hard corals in East African coast. 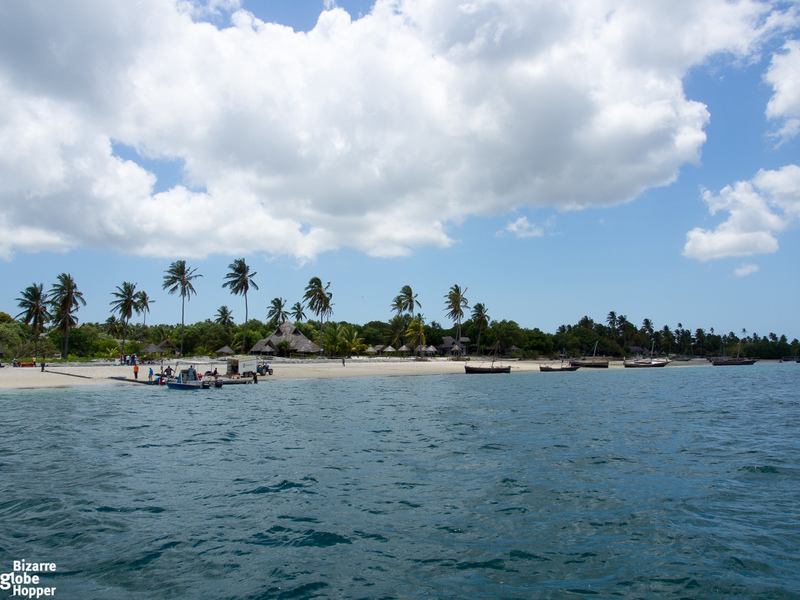 Mafia Island Marine Park is the first marine park in Tanzania. The marine park was founded in 1995, and it’s supported by WWF. At whopping 822 square kilometers, Mafia Island Marine Park is also the biggest marine park in the Indian Ocean. 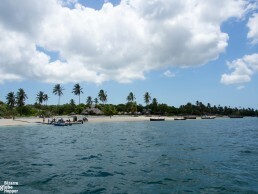 In addition to Chole Bay, the park includes the southern part of Mafia Island along with some of the northeastern areas, and the islands of Chole, Juani, and Jibondo. Mafia Island Marine Park remains still as a well-guarded secret among diving and snorkeling enthusiasts, meaning just a handful of tourists and uncrowded sites. 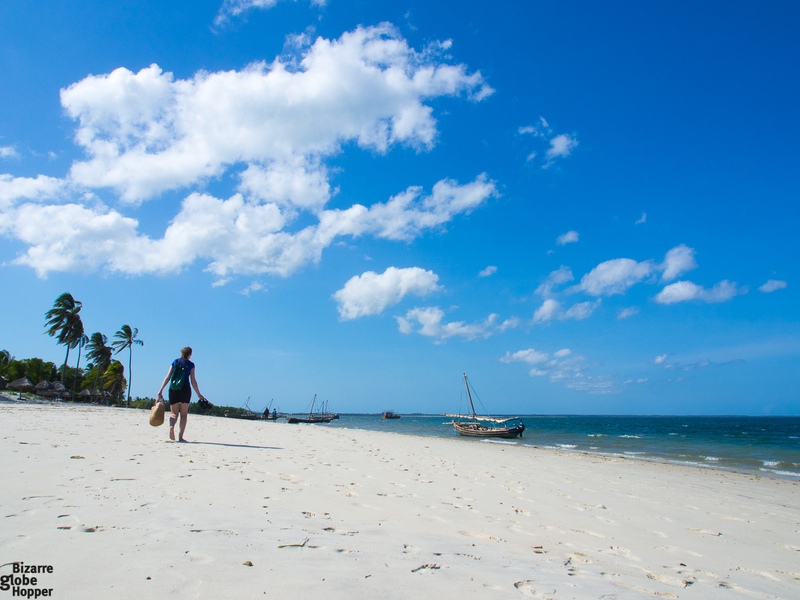 It’s hard to believe that the best snorkeling in Tanzania comes without the crowds! *Disclaimer: Our snorkeling trip in Mafia Island Marine Park and Chole Bay was hosted by Butiama Beach, but all the opinions remain entirely our own. The tiny island of Mafia has it all: unparalleled marine life, weird dwarf hippos and flying foxes, deserted beaches and intriguing history.